Look through coloured plastics to filter out part of the spectrum, and observe how objects change colour. 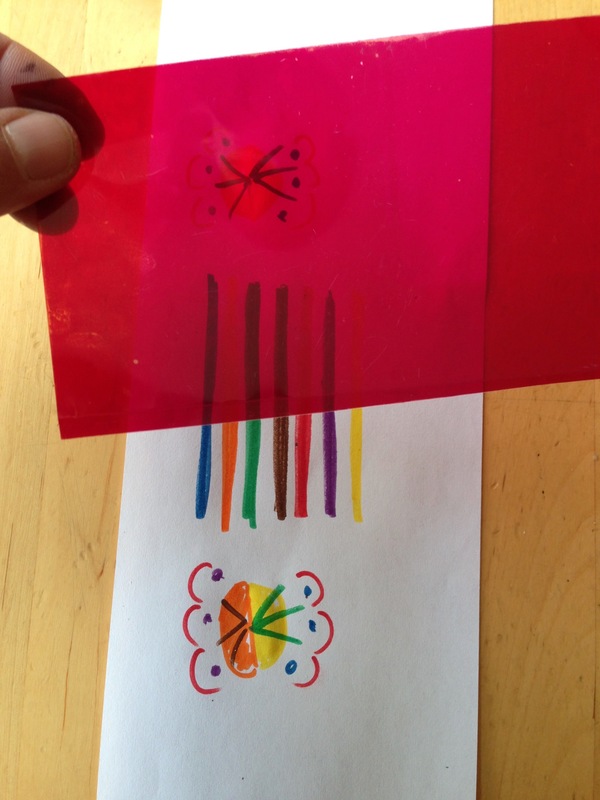 Ask students to look through coloured plastic sheets at different coloured objects, or to view drawings they make with coloured markers. Try outdoors. Depending on the colour of the object/marker and the colour of the filter, different features will be highlighted and will "disappear". The coloured plastic takes away (absorbs) some of the colours so only one colour reaches your eyes. e.g. a red sheet absorbs all colours except red, so everything has a red tinge. If something has no red in it, it will look black. Ask the students to take the plastic away so they can see the true colours of the papers. It is a very striking effect. 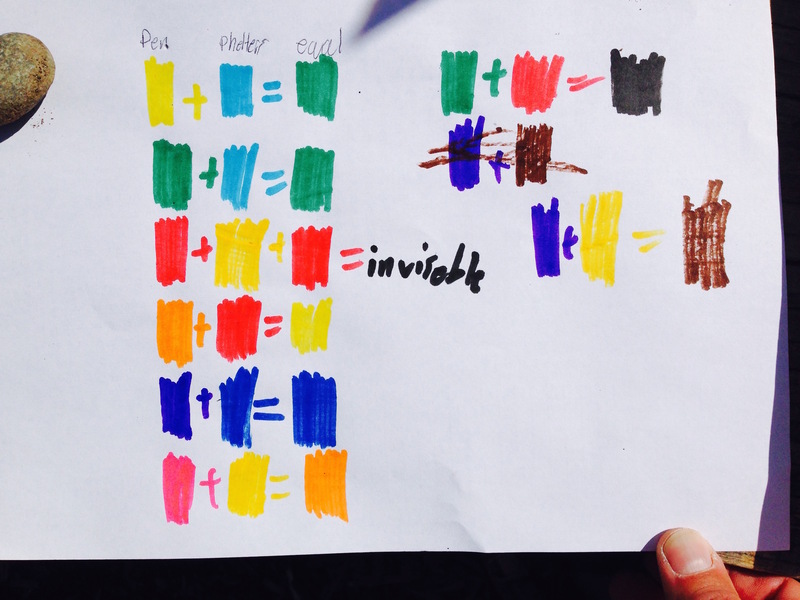 Discuss: the paper only reflects some colours (that is why it appears a certain colour - the other colours are absorbed). 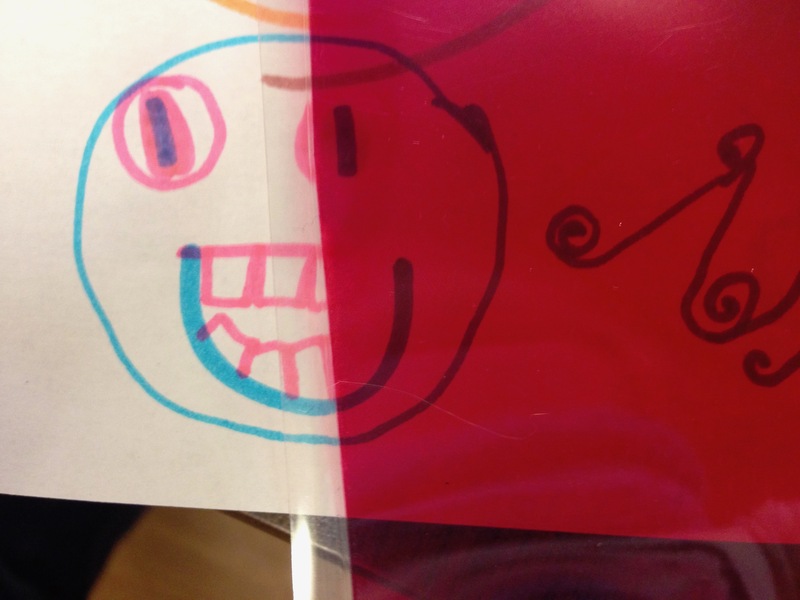 If the plastic does not let the paper colours through, the paper will appear dark. Objects and filters are usually not pure emitters of one colour, so other colours nearby in the spectrum also bleed through, hence changing the final colour observed. In other words, for coloured acetate and construction paper, both the papers and the filters will allow some other colours of light through other than the colour it appears i.e. green paper will reflect yellow and blue light as well as green (they are next door on the colour spectrum), and a blue filter will allow some green light to pass - hence through a blue filter, green paper appears green and red paper appears black (see image 2). Some blue items appear purple through the red filter. The red filter is not perfect - it passes some light of other wavelengths besides red. Purple is a mixture of red and blue light - it is a non-spectral colour (violet is a spectral colour next to blue). When objects emitting blue light are seen through our red filter, both red and blue light are perceived, which look purple. Astronomers use filters to look at images of stars and galaxies, to see the phenomena they are more interested in, while making other phenomena recede. 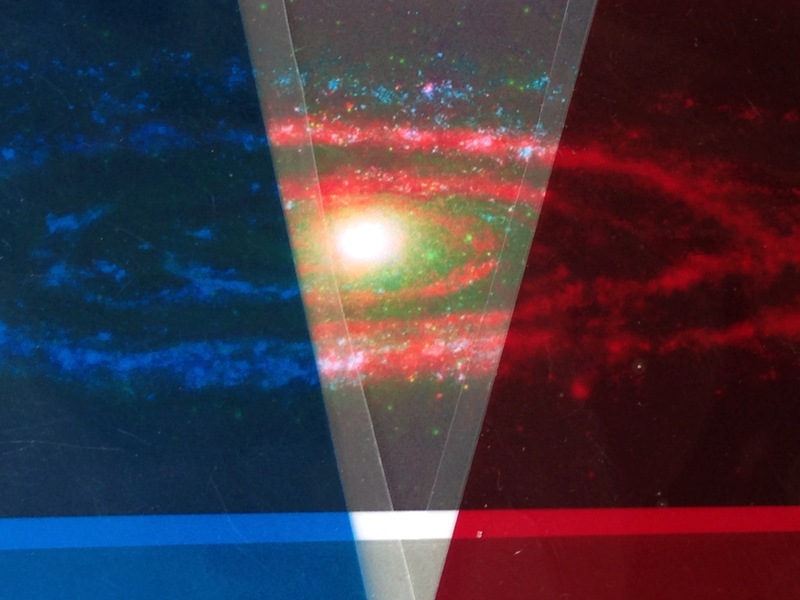 Students can look at composite images of star nurseries, nebulae or galaxies, to see the cooler gas clouds (often imaged in red, so visible through the red filter) separated from the stars and higher energy wavelengths such as X rays (often imaged in blue, so visible through the blue filter). Ask students to draw an undersea scene with coloured markers, making sure that they draw some brown or black seaweed or rocks, some red and black ocean animals, and some light blue or light-coloured ocean animals. Ask them to look through a blue filter at their scene, which mimics the lighting in ocean water (red light does not penetrate beyond 100m deep, whereas blue light reaches deeper ocean water, making the scene blue-tinted). In the blue light, which fish colours appear dark, and which fish show up lighter? Red-coloured fish will look dark, and look the same shade as black objects. Blue and lighter coloured animals show up more brightly and are easier to see. 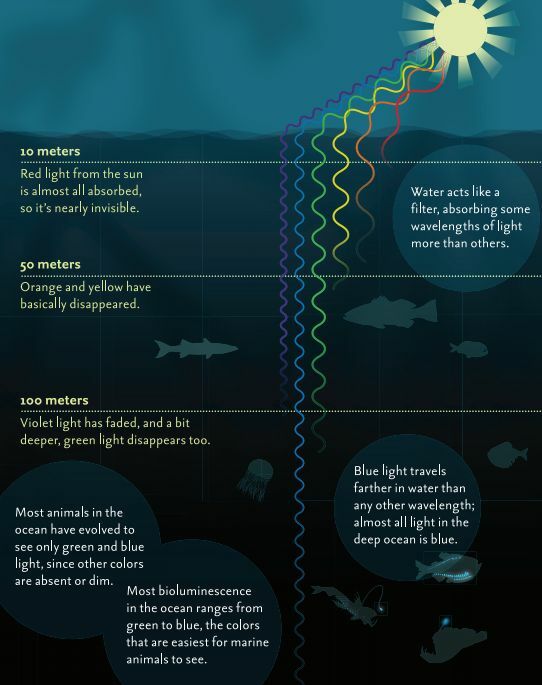 Ocean animals exploit this phenomenon to hide from predators: in the mid-water regions of the ocean, where only blue light penetrates, many ocean animals are coloured red or black, so that they can camouflage against dark algae and rocks or just appear dark in the water. Through the filters the world looks tinted and some colours look the same, and give a sense of how some animals or people with colourblindness have a different view of colours. The color vision of dogs is similar to a person with deuteranopia (red-green color blindness). Red, yellow and green are perceived as one hue. Blue and purple are perceived as a second hue. Cyan and magenta are perceived as a neutral hue (grey). Idea for younger students: make a "dive" into the ocean by walking into a room with blue filter over eyes. Find fish taped to the wall.